We share here to download GPT Professional Tool V1.0.3 Crack from here, GPT Tool V1.0.3 Crack is a small utility Android Multi-tool that helps to remove All Android, Samsung, LG devices, MTK, Qualcomm Devices. GPT Professional Tool V1.0.3 Crack is available now to download from here, it is now only available to the beta version. and it supports almost all honor devices in ADB and Fastboot mode. here share with your latest Keygen file also to activate the GPT tool V1.0.3 Crack on your pc. we discuss some more features of this tool on below. 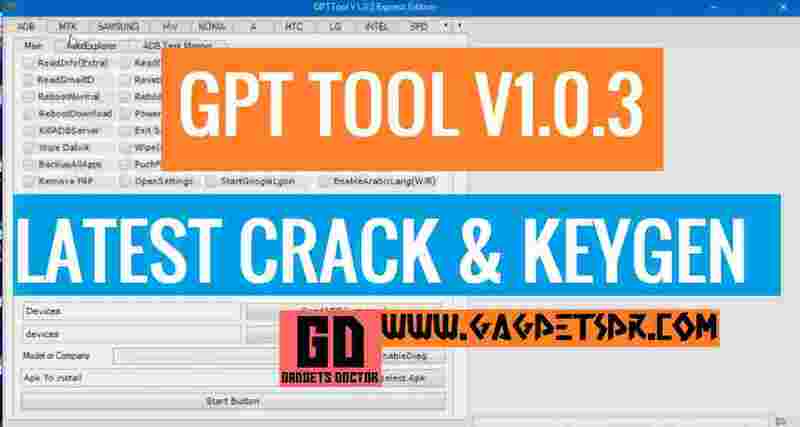 Download GPT Professional Tool V1.0.3 Crack comes with an installer package. to use this tool you need to install this tool first on your PC to use it. then install Huawei USB driver to Remove FRP from your Huawei Devices using this tool. GPT tool V1.0.3 Crack the main feature is it will remove all Huawei honor device FRP in “3” steps. after the power off your device then put your device to PC, then open this tool, first click on the “Step 1” button. after that, it will enable the “ADB” in your device, then click on the “Step 2” restart your device after “2” minutes, now follow the last step the “Step 3” it will remove FRP from your device. -Run the “GPT tool V1.0.3 Crack.exe” from there. -Done, now wait a few secs to launch the tool to your computer. then you can use the tool. Thanks for visiting us, Comment below if you face any problem With GPT Professional Tool V1.0.3 Crack, we will try to solve your problem as soon as possible. you can check other some tutorial here to help you.